Enjoy a trip aboard two of Alaska’s greatest forms of transportation and learn local history along the way. You will begin your trip in Talkeetna, where you will board the Hurricane Turn train—one of America’s oldest flag stop trains. 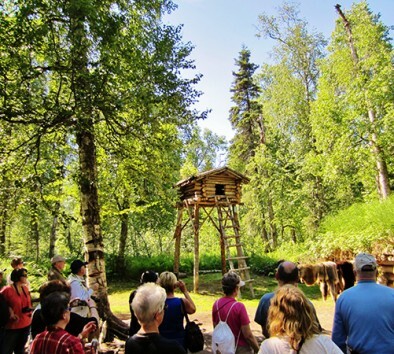 You and your naturalist will travel to the historic town of Curry which was the halfway stop between Seward and Fairbanks during the two-day steam train trip and a very popular resort in the early 1900’s. You will be given a tour of the town of Curry where the once grand Curry Hotel (built in 1923) stood. After your tour, you will rendezvous with a jet boat and enjoy a refreshment and beverage while you travel down the Susitna River to a ½ mile nature walk. Here, you will learn of the earliest settlers in the area—the trapper and the Dena’ina Indians. Along this trail, you will learn how each group lived and survived in a very basic and rustic manner. Your naturalist will also teach you about some of the local flora and fauna. Once you have learned of the early settlers, you will re-board the jet boat for your travel back to Talkeetna. Wear comfortable walking shoes. Dress in warm layers. Bring a camera. Wildlife sightings are likely but not guaranteed. Tour will operate rain or shine. Tour operates subject to meeting a minimum number of participants. Guests must be able to board and disembark the train and boat without assistance. Tour takes place in Talkeetna. Activity level: Moderate.